I delivered milk for Bill Lane in the early 60s before setting off for School each morning. Most times is was on a grocer’ s delivery bike or by two hand crates then returning to top up at the dairy. Many mornings I would have open the dairy to allow the wholesaler to drop off the milk. Who can forget the terrible winter of 1963 when I was delivering milk by hand in knee deep snow before going to School. Never missed a delivery . My father was a buddy of Bill Templeman. 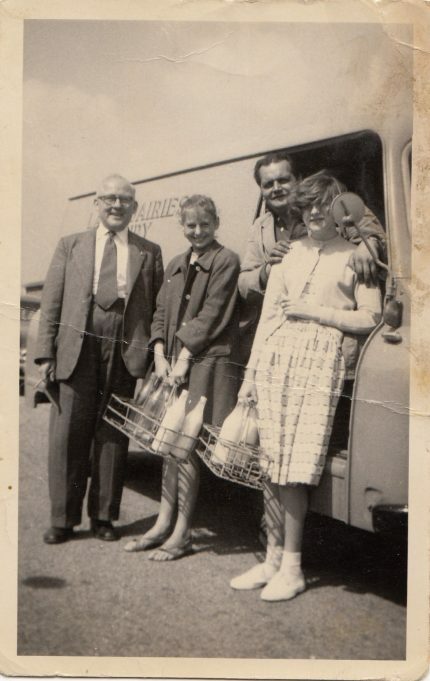 My brother worked for him on Saturdays collecting the milk money all over Tilbury, then my other brother worked for him delivering milk for a short time until he broke his ankle. When Michael, the elder one left school and went on to college in London, I took over the collection round on Saturdays and Sundays from the age of 13 to 16, when I went to work just on Saturdays for Go Gay Hairdressers. My Mum wanted me just to work on Saturdays as I was supposed to be studying for my G.C.E’s! Bill paid me 13/- a week and then I earned 7/6d from Go Gay. I remember your Mum, Mary and I also went to you wedding to Robbie. It was a grand affair for me at the Catholic Church and then at the Railway Club I think. One strong memory I have of many is when someone was stealing milk from our doorstep. My father I think knew who it was but of course, in those days Bill delivered the milk so early so he always missed the thief. Bill and he devised a method to stop them by carefully taking the silver top off a bottle and filling it with Epsom Salts and other nasty white substances. We never had another bottle stolen. Bill also ran a car hire service didn’t he and supplied the cars for my brother’s wedding at West Tilbury and also came to collect me from Heathrow when I returned from Canada after two years away. We lived at the Diamond Jubilee Off Licence from the age of 5 until the 70’s and still consider myself a Tilburyite. It was a wonderful, vibrant, exciting place to me. Wow look at me there 51 years ago, and look at uncle Bill such a lovely gentle man.